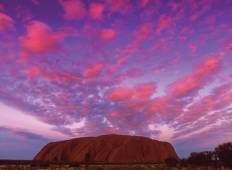 Find a Camping trip that explores Uluru - Kata Tjuta National Park. There are 17 tours to choose from, that range in length from 3 days up to 17 days. The most popular month for these tours is May, which has the most tour departures. "Early morning early wakey wakies and long drives but all worthwhile. To see Urluru..."
"Was an amazing time. Everyone was so jealous of my trip :)"
"A bit disorganized, confusing even sometimes, as far as the itinerary goes... As..."
"Great camping/glamping tour of central Australia. 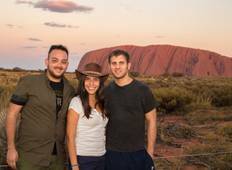 Our guide Keith was a wealth of..."
"It was great that our guides were so clued up and made sure that we were ready at..."
"We have just completed the Alice Springs Uluru Safari trips. We were most fortunate..."
"Ryan and scruffy were both fantastic!" "What an interesting experience after spending time in some of Australia's big cities...."